Developing and promoting apps isn’t an easy endeavor, mainly because app markets are ridiculously crowded. As an app developer, you should only be concerned with improving your app(s) without having to worry about complicated tasks to do things like advertise or take payments. Every app developer needs to have a great lineup of third-party go-to tools and services to help create, launch, monetize, and market their apps. 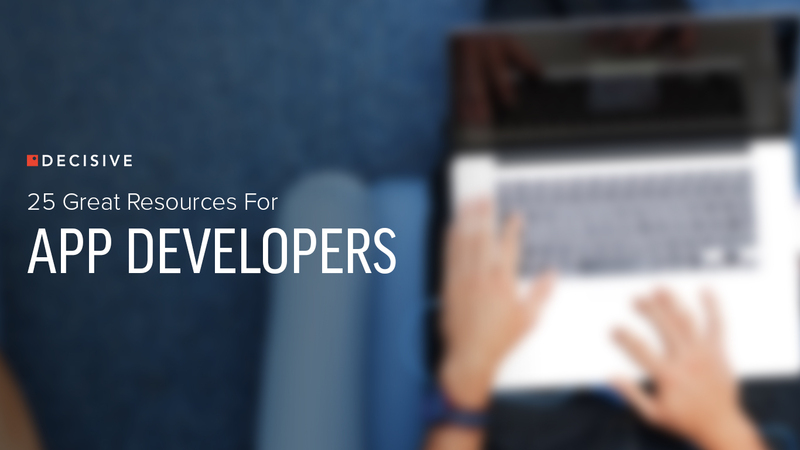 Here are 25 great resources for app developers that you should try or bookmark right now. The tools and services below are categorized by stages, from development and prototyping to post-launch. CodeRunner – Not that you don’t already have a coding solution, but you can use CodeRunner to easily write code on your Mac. You can run your code instantly in any language. V-Play - A cross platform SDK. UsabilityHub – Are you unsure about your app’s design? Use UsabilityHub to test your designs on real people. You’ll learn how visitors will interact with your design before launching and improve your weak spots. Corona Labs – Corona Labs provides development products to make mobile development easy. Their most popular product, Corona SDK, is a cross-platform mobile development framework that enables developers to create graphically rich apps. Fluid UI – Fluid UI helps you prototype and wireframe mobile apps. mParticle – Throughout the development and promotion process, you’ll most likely need to do several integrations to power your app. mParticle allows you to integrate services fast and easily through their single SDK. No changing code or resubmitting for app store approval. MacRumors Forums – We all need communities. The iPhone/iPad Programming section of the MacRumors forum is a great resource for iOS app developers to get their questions answered by other iOS app developers. XDA Forums – iOS app developers aren’t the only ones that need community. XDA is the most popular site for Android developers. Stripe – PayPal’s greatest rival, Stripe’s APIs allow you to accept and manage payments. Envato – Developing your app is only half the battle. You need to brand it and promote it with mockups and such, which means you need the creative assets to do that. Envato is a great website to get everything you need for your next creative project. Product Hunt – One of the best free promotion resources is Product Hunt. Product Hunt is a curation of the best new products, every day. If you have a new app that you want people to try before you launch, sign up for Product Hunt. Post-launch is fine as well. PressFriendly – Looking to get some press for your app right before you launch? Use PressFriendly’s interface to organize your contacts and emails and track emails to tech journalists. 25 Creative Ways to Promote Your App For Free – You’re just about ready to launch your app, and you’re looking for ways to promote your app for free. Check out this article featured in Entrepreneur that outlines the top 25 ways you can promote your app for free. 11 Pre and Post Launch Mobile App Marketing Pitfalls to Avoid – Before you even launch your app, you should read this to avoid common mobile app marketing pitfalls. Mixpanel – Touted as “the most advanced analytics platform in the world for mobile & web”, Mixpanel is a go-to platform for app developers to measure user interactions in their apps. Kochava – The most important metrics you should be concerned about besides engagement and conversion metrics are attribution metrics. Kochava is a mobile attribution and analytics platform. Their SDK provides out-of-the-box integration with over 1200 publishers and networks. Apsalar – Apsaler is another platform that allows you to collect and analyze in-app behavior data. Heatmaps.io – Want to know how people engage with your iOS app. Use Heatmaps to visualize and track user finger gestures and discover device orientation preferences. App Developer Alliance – The Application Developers Alliance is a non-profit global membership organizations supporting developers. As a member, you can get access to exclusive content, events, discounts, research, and policy issues. Now that you’ve read about some awesome tools and services, go out there and create great apps!